The same 10 songs on repeat. The sweet smell of sweat and steroids. Mirrors, lots and lots of mirrors! Sound familiar anyone? Incase you're lost, I'm describing the gym. A while ago I decided that this fitness malarky was a train that I was going to get on. So I found myself signing up to my local gym thinking that this was the right ticket. Now I'm not saying that it was wrong one (I know some people that really love the gym), but I personally didn't get on with it. It felt like a boring chore I was obligated to do in order to get fit. I resigned myself to this fact because I was under the illusion that working out couldn't possible be fun. I couldn't have been more wrong. In regards to my own person fitness goals, I still have a long way to go however, I feel I have turned a bit of a corner when it comes to actually enjoying the process. Everyone has their own preferences but I personally find fitness more fun in the application of a hobby and social/competitive sports. After speaking to many people about fitness, I have realised that there is a certain intimidation and demotivation associated with the gym. A major struggle for motivation that I have encountered is the boring/sameness that the gym provides. This might be great for some, but for others a more interesting and scenic option might be more inspiring. 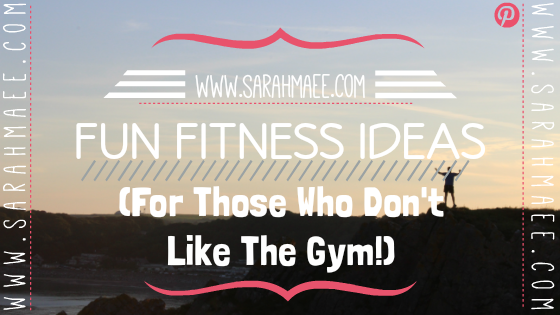 For these reasons, I feel it's important to explain that going to the gym isn't the only way to get fit. For this weeks post I have decided to share some alternative workouts to help inspire those who don't enjoy the gym. Swimming is such a relaxing way to workout! It's super low-impact making it a great form of cardio and muscle strengthening without putting any pressure on your joints. Why not venture down memory lane and start roller skating? The best thing about skating is that it's so much fun, you don't even realise you are actually exercising! There are so many awesome tricks to learn and you could even use your skates as your means of getting around town. Aerial Acrobatics may sound a little intimidating but I assure you it is super fun. Recently I have attended a couple of Aerial hoop classes, which I personally find really challenging but really enjoyable at the same time. It requires a lot of strength but the strength is achieved through the application of some really cool moves and sequences. Strengthening and conditioning training is still necessary however, working towards a fun goal somehow makes it feel more bearable. Whether you find a gymnastics centre or end up at flip out with some friends, trampolining is such a fun way to be active! Like Most other suggestions on this list, you don't realise you are actually doing exercise until after you have done it. Also, There are some really awesome parkour trampolining places out there. I know this one may seem a little obvious but it's honestly so good for you. You don't have to compete in the Tour De France or anything. Just simply swapping your car/public transport for a bike can be really effective! I personally find bike rides super relaxing (especially during summer!). Not only is yoga good for muscle strengthening and breathing techniques, it is also amazing for your mental well-being as it is so relaxing and calming. I understand that this isn't necessarily everyone's cup of tea but you never know until you try. I would also recommend that when you start, you attend a class to be sure that you are doing it right. I know there are a lot of useful online resources but I also know that there are a lot of people who often struggle knowing how to effectively start. If you are unsure, attending a class might be more beneficial (even if it's only the first one). Share book reviews and ratings with Sarah-mae, and even join a book club on Goodreads.